Michelle Jackson has studied art and interior design since 1983. She has attended design school and worked as an artist/visual artist. It is 2018 and you are ready to get moving! If you are like me you woke up this morning to Christmas decorations, and lots of clutter. Today we are going to tackle your life and your space. Life changes such as moving, taking in family, or becoming an empty nester cause us to reevaluate our possessions. The purpose of reevaluating your possessions is to bring you into a positive place where you have only the things you use and love. Today we are going to tackle your life and your space. Now look back over your list and write down the items that you need to do those tasks. Organizing starts with the principle: put it where you use it and if you don’t use it, get rid of it. What means that is if you get ready for work in your bathroom, your make up shouldn’t be in a drawer in your bedroom. Did you have any revelations? Years ago my clothes hamper was in my bedroom walk in closet; however, we always changed our clothes in our master bathroom. This created an extra step to keeping the bathroom picked up because; we had to carry our dirty clothes back to the closet to put them in the hamper. We are always in in a hurry and clothes were often left on the bathroom floor. Now our hamper is in the bathroom, problem solved. What if your bathroom is too small? Utilize a space right next to the bathroom door, possible in the bedroom next to the bathroom door. Put things where you need them and are going to use them. Let’s start with some motivational thoughts. In the philosophy of Buddhism we are taught to see everything in our life as already broken so that when that item actually gets broken or leaves our life we are ready to let it go. Everything we have is transient in our lives and this includes things. In your mind see the things that you have as being broken and transient. The second thought comes from my Brother in Law. Years ago they moved into a smaller house and my brother said “you know sometimes more is just more” In other words sometimes you have more things and it’s just more things that are not adding value to your life. What you may notice is that you have a lot of items you do not use that simply take up space. We have books all over our house. I have college books, my husband has tons of books on business, we have entertainment reading materials, I have books for decorating it’s an endless pile of books. While I considered going to a tablet library, I quickly dismissed the idea because, we like books. At that point I did pare down the books in my home. Obviously, I don’t like every book I read, those were the first to go. When you pare down an area start with the obvious, a single person probably doesn’t need an oversized crock pot or a 20 cup coffee maker. Be realistic in what you use and do not use. 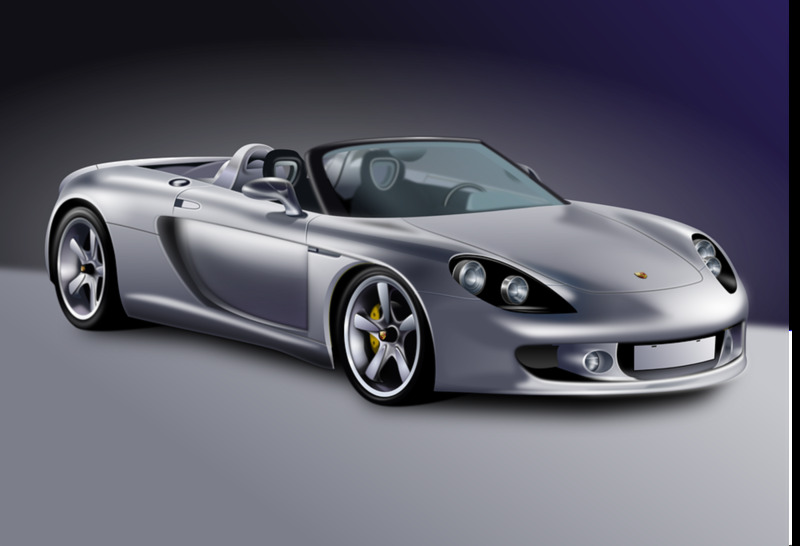 Do not be afraid to sell something you have to get something that is size appropriate. In other words your old house might have had space for a large hutch but, in your new house you do not have that big of a space, so sell it. Get one that is more appropriate for your space. Somewhere in your house is an item you paid a good amount of money for and you have not ever really used that item. This item might be clothing that didn’t fit right and didn’t get returned, or maybe it was an item you needed briefly. The amount we pay for an item is the ransom we hold against that item in our hearts. Somewhere inside of us we feel like the item has value just because we paid a lot of money for the item. I can prove to you this is not true. The first VHS video recorder cost an average of $5,000.00, and now that item is useless. My cell phone videos are way better than the VHS ever was, so are you still going to keep the VHS video recorder? In some cases the longer you hang onto the item, the less useful it becomes, not just to you, but to anyone. The second reason we hold onto these high dollar purchases is that we hate being wrong. Some purchases are mistakes. When we make a mistake, as all humans do, we should be able to admit it and correct it. Yet, when it comes to shopping mistakes we keep them around as sad reminders of our disappointment. Now how can that bring your life any joy at all? Let it go. That Armani jacket that doesn’t fit you, let it go. That wired sound system you never hooked up, let it go. That project scooter in your garage… let it go. I am a sentimental person, I always have been. When we lose someone close to us it’s easy to try and save their memory by holding onto everything they owned. Keeping tons of stuff from someone else’s life is not a good way to honor them. Family Heirlooms should be enjoyed not become a burden. Pictures should be labeled and archived. Furniture is a difficult decision. If you are not an antiques person, you can still incorporate an antique piece of furniture into your home without cramping your style. Some antique pieces can be re-purposed to fit in a current living situation. An example of this is using grandma’s kitchen table as a desk in an office, or using an old hutch to store linens in a hall. Keep in mind that not all things handed down are family heirlooms. Heirlooms should have a story attached and go back more than two generations. An example of this is a dressing table that belonged to my great grandparents in the 1920’s. When their house burned my Grandfather managed to get the dresser and a steamer trunk out. I still have the dresser my cousin has the trunk. If you are afraid to get rid of something, make it disappear and see if it is missed. Three years ago I took all our DVD’s and set them in the garage (4 boxes). Then I waited for everyone to complain that they couldn’t find the DVD’s. It never happened. We have pared down the DVD’s to two shelves in the hall closet, these are movies we never see pop up on Netflix, that are family favorites. If you can make something disappear without complaint, then you don't need it. The idea of cleaning out all your closets and drawers can be overwhelming. Yet, if done correctly this clean out can save you time. Now that you have a plan of what you do in each room, let us discuss the clean out. Did you know that cosmetics expire? None of your cosmetics should be use for longer than a year and some of your cosmetics are only good for 6 months such as mascara, concealer, and foundation. Here is a fun fact, cosmetics carry germs (please do not share them). If you are using the same products and still can’t kick a cold or virus, toss that stuff and get new stuff. With some products you can tell when it expires, such as nail polish that is separating. Make up brushes should be cleaned with rubbing alcohol twice a month or get new ones. Toss out anything you don’t use such as waxes that didn’t work or nail clippers that won’t cut right. The only personal care items that you should donate are those that do not have direct contact with the skin. These items would be bottled shampoos/soaps and perfumes or unopened items. Used cosmetics should never be donated to a charity. Go through your medicine cabinet. Vitamins, medicine, and things like contact lens solution have expiration dates. In a recent clean out I found 3 open bottle of contact lens solution, four vitamin bottles, and cold medicine, all expired (I’m a vitamin hoarder). Sunscreen also expires! Anything that doesn’t fit you, get rid of it. Anything that needs repair put into a pile. If you are not able to fix the item yourself then ask yourself will I ever take these items to get fixed? If the answer is no, get rid of it. Anything that isn’t your color or style, get rid of it. Formal dresses are used once. It doesn’t matter if your cousin Jean picked a mid-length dress for her bridesmaids because, none of them are ever going to wear the dress again. Don’t let it take up space in your closet. Shoes that are uncomfortable, get rid of them (life is too short for uncomfortable shoes). Fashion accessories are an item that women hoard, but let’s be honest the second you buy a new black purse, you are not going back to the old one. The same is true for your new stylish sunglasses that bought to replace the scratched ones, you are not going to ever wear the scratched ones again. These are some things that you will use more of, scarves, shoes, and belts. Be realistic about how much you wear your items. If you catch yourself passing over an item, it is time to get rid of it. What you have left in your closet after you pare it down is what you wear every day and that is what you need. For those of you who feel a sentimental attachment to clothing; take a picture of you in the item, frame the picture and hang it in your closet, then get rid of the item. If that is too much work, you probably do not love the item. I gave my wedding dress to someone who couldn’t afford a dress. That sounds weird? I knew I was never going to wear it again. I didn’t give away my marriage, it was just a dress. 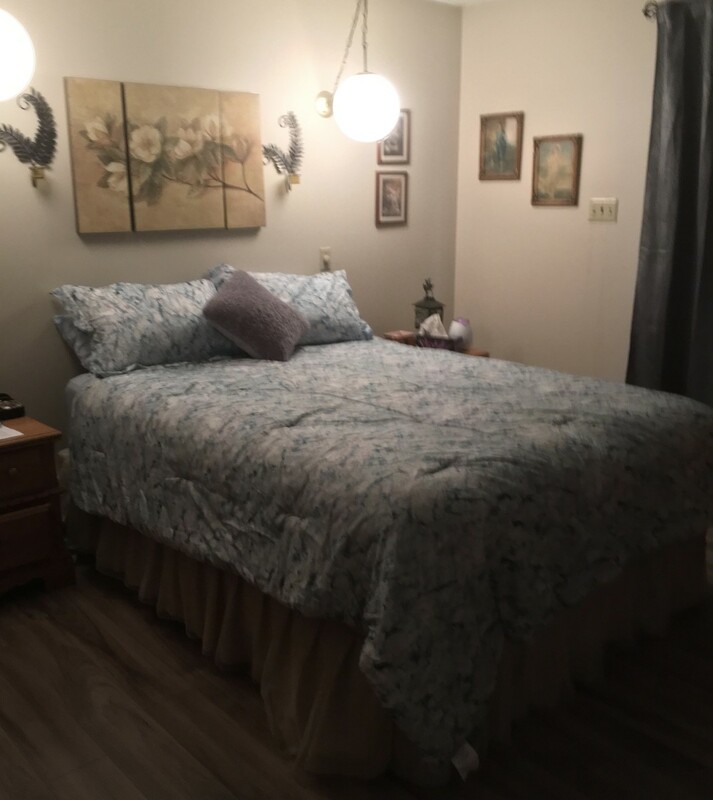 Your bedroom should be a tranquil place for you to decompress at the end of the day. Do not cram tons of possible activities into your bedroom. Keep your room clean and as free of clutter as possible. Do not bring work or projects into your room it steals the romance from the room. If you have to have a desk or office space in your room, make it a closing cabinet so you are not distracted by work. A good closet is a joy forever. My entire sandal collection is on the back of my closet door in a shoe rack. Because flip flops are flat these items do not disturb the functionality of the door. Decorative wall hooks on the closet wall hold my scarves and purses so I can make quick selections. Jewelry boxes or organizers should be in the room where you get ready for your day. When jewelry storage is not easy to access, jewelry ends up piled all over counters and furniture. Shoe storage depends on your closet. We had an open closet wall and we attached racks almost to the roof. Your solution will depend on your space. In the bathroom, use space wisely. we do not have a tooth brush holder. Our tooth brushes are in an organizer in the top drawer. This gives us one less item to leave out on the counter. I limit the counter to q-tips and hand soap. My drawers have dollar store organizer to separate things like contact lens stuff from razors. I put things I rarely use in the back of my drawers. 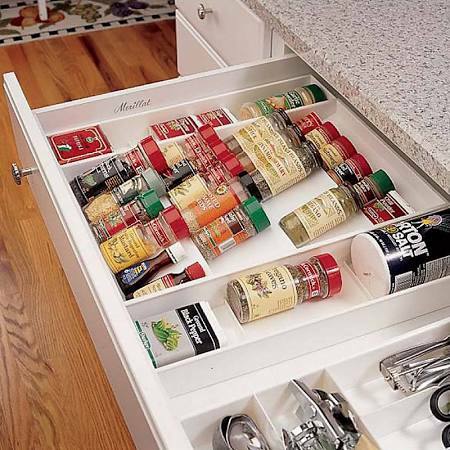 Another thing I found useful is Slide out drawers for under my sinks. They make it so much easier to get to things in the cabinet. Another put it where you use it is toilet paper. I am a firm believer that extra rolls of toilet paper should be within arms reach of the toilet. Even if they are just in the basket on top of the tank. The kitchen is one of those rooms in the house that collects gadgets and appliances. Right now I have a bread maker we haven’t used in over a year and a slicer we have never used (although someone in the family keeps insisting he uses it). We have managed to reduce the amount of dishes, although it still seems like my cabinets are going to attack us. As people we go through phases. My parents went through a homemade ice cream phase when I was a kid. That lasted one summer. While these types of phases can be fun, they rarely become routine. As you look at your kitchen do you have an appliance you don’t use? If so, donate them. Kitchen utensils work just like old accessories in your closet, you play favorites and the rest you don’t need. No one needs 12 spatulas. Years ago a family’s house burned down, they lost everything. We didn’t have any money to give them. I did manage to give them an entire kitchen set from what I had (because I had two of everything!). The point is you don’t need two of everything. If you need a system for paring down your kitchen, put a chalk marker dot on all your utensils, pots and pans. In three months all the items you have used and washed will not have the dot (chalk marker comes off when it gets wet). Get rid of anything that still has the dot. My husband has an outdoor grilling station with a bar he built. I put a sealed container out there to hold all his outdoor utensils that way his giant tongs are not jamming my kitchen drawer. Go through your spices, check for expiration dates. If you have more than one open thing of cinnamon and the expiration dates are close, combine the two. Get rid of plastic containers without lids. We all know the lids disappear like socks in the wash. Once you have looked for that lid and been unsuccessful in locating it, give up. Don’t create more work for yourself when organizing your home. Pot racks are a great storage option that collects dust. 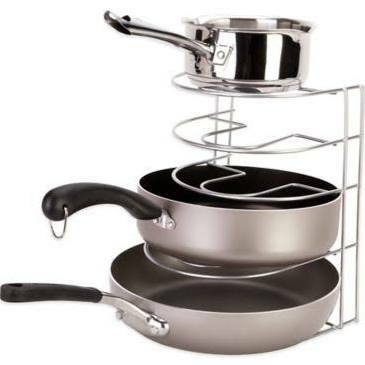 If you choose a pot rack as part of your storage, be prepared to take it down and clean it every six months. The same is true for any counter or out in the open storage. The closer to the stove the more often you will have to clean the rack. 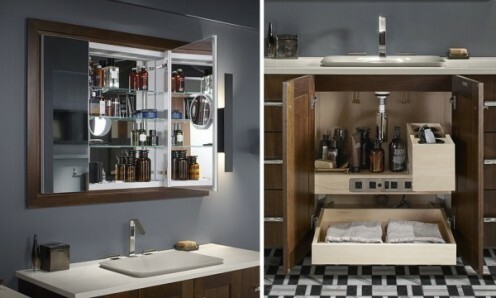 Use high cabinets for any items you only use occasionally. In my case the cake plate, bread maker, and cookie cutters are in my upper cabinets. My glasses/cups are always in the cabinet beside the refrigerator. Coffee cups are in the cabinet above the coffee pot and so on. Drawer organizers only work if the items you are organizing fit in the organizer. Before you buy an organizer measure the longest thing you want to store then when you get to the store you can make an educated guess about what you are buying. I am not a fan of utensil hanging on the walls in kitchens, because if they are close to the stove they get oil on them and if they are far from the stove then it is impractical. One container of utensils on the counter is good as long as it is size appropriate to the kitchen. No one needs three canisters of kitchen utensils on the counter. 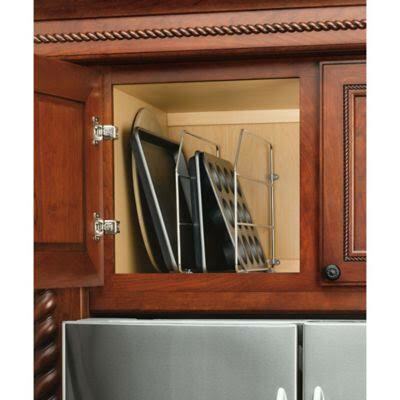 Look for unused space in places like cabinet/closet doors. Over the door storage is a great option in the pantry or closets. 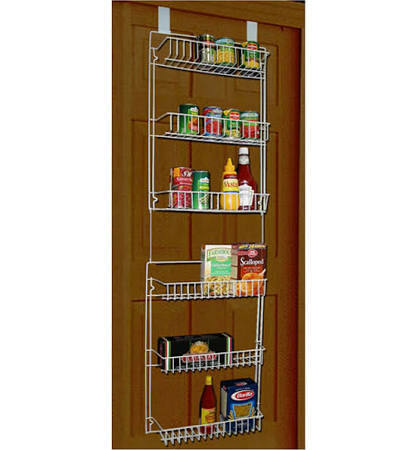 They make racks for pantry doors to hold smaller items that get lost in the pantry. My spice rack is actually a spice drawer. It makes it easier to see all the spices and it’s close to the stove. We have a duffel bag that goes into my vehicle in the summer and stays their all season. The bag has beach towels, sun screen, lotion, q-tips, goggles/snorkel, and my husband’s book (he doesn’t swim). When the towels get soiled I wash them and they go right back in the bag. We can leave for the beach in minutes, no gathering of items, we just go. This frees up space under our bathroom sink since I’m not storing beach towels next to our everyday towels. In the winter the bag lives in my laundry room. This idea could be applied to any family who does something seasonally. In the last few years people have ditched their entertainment centers for credenza type tables and flat screen televisions. This movement has neglected the storage of items such as video games and DVD’s. Tech geeks will tell you to burn your movies to an external hard drive. That solution is not for everyone. 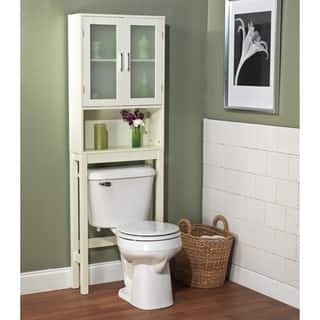 Personally I prefer to not see a wall of movies, so my recommendation is a cabinet with doors. However, if you like your movies displayed, go for it. Movies are another one of those things that you should go through and get rid of ones you didn't like. Sell those two star movies at a yard sale. Like purses most people stop using their old jacket when they get a new one. If you buy a new Jacket, donate your old one to a homeless shelter. If you have old sports clothing from teams you played on, that's great but, if you are never going to wear it, let it go. Our hall tree is catches our coats in the winter and is a place to sit and throw on your shoes. If you have a closet in your entry then you don’t need coat storage in your entry. Hanging coat racks or benches are good storage solutions as well. When you live in an area where muddy shoes are a possibility a boot tray in the entry is helpful. I also recommend industrial rugs for the entry when you live in places where it snows. You are probably wondering why I didn't discuss the over use of decorative elements such as figurines or candlesticks. Well That is because some of you really enjoy your stuff. I'm to the point where I don't want to dust a lot. I'm trying to keep those decorative items in cabinets. The rule is that if it doesn't bring you joy, then let go. Often out collections reach an unhealthy level. Maybe you collect bears, but you only really like the brass or glass ones. Let the others go. Life is short, we should live well and that means getting rid of the excess stuff that weights us down. 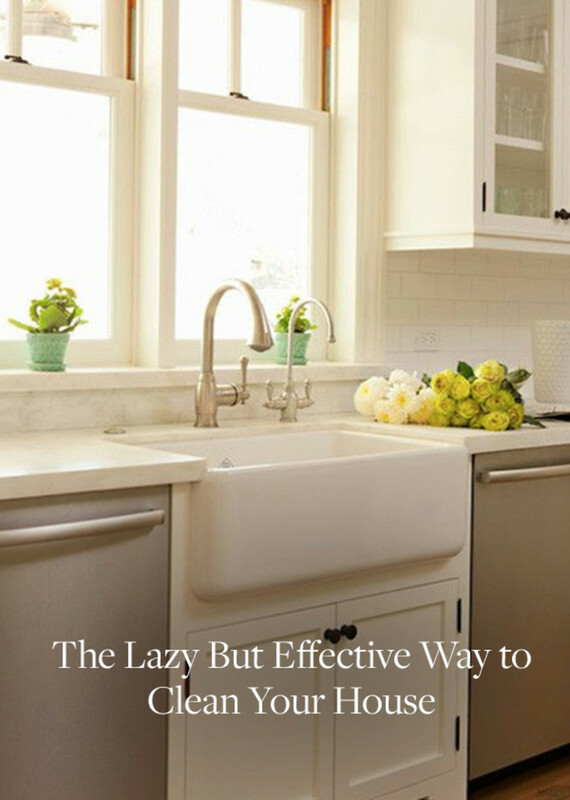 The Lazy But Effective Way to Clean Your House! I see people reluctant to let go of things they overspent on. Yet, those aren't being used and just clutter up your house. Joining a number of decluttering and minimalism groups on Facebook has really opened my eyes on this.